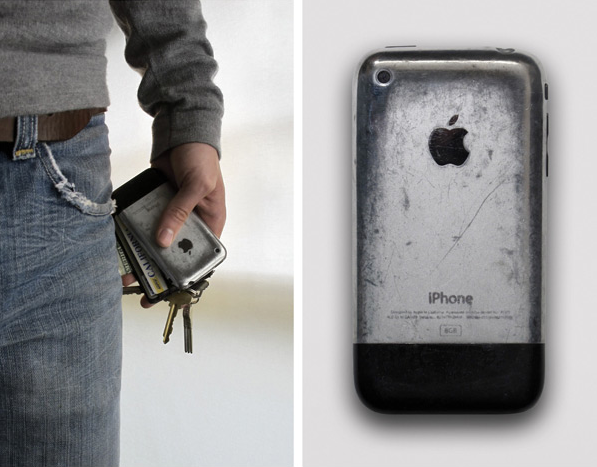 Quello della foto è il primo iPhone, dopo tre anni di vita in un taschino dei jeans condiviso assieme a un mazzo di chiavi. È pieno di graffi, ma stanno bene: gli danno un’aria vissuta e unica. Quanto rappresentato nello scatto sopra dovrebbe essere uno degli obiettivi da raggiungere nel disegnare un qualsiasi oggetto: che deve essere bello non solo a un secondo dall’acquisto ma nel tempo, con l’usura. The truth is that consumer products are ‘new’ for a very brief moment when they are first removed from the packaging, but spend the great majority of their useful lives as ‘used’ products in the process of decay. Many welcome the breaking-in of products like a leather wallet or a pair of jeans as this wear can be aesthetically-pleasing. The Japanese have a term for this, “Wabi-sabi”. Wabi-sabi can be used to describe the aesthetically pleasing wear of an object as it decays over time. It’s a notion that embraces the transience of objects and celebrates the purity of the imperfect. Aging with dignity is a criteria designers should recognize in their efforts. I’m thinking of a future when products are designed not for the brief moment when they are new, but for when they have been aged to perfection.